Reinforced polymer stock fits onto M4 Carbine style buffer tube and lets you keep a loaded magazine on the rifle at all times. 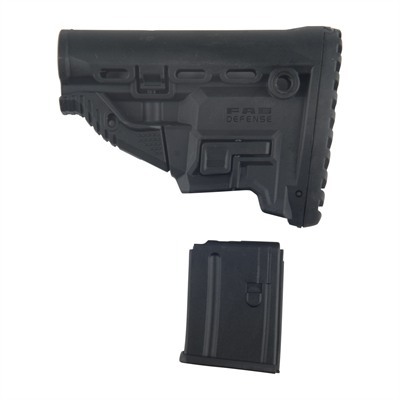 Includes polymer 10-round magazine, and accepts all other standard-sized AR magazines. Quick-release gives instant access to extra magazine and under-stock position keeps magazine from getting caught on gear or webbing. Unique inverted positioning lever makes it easy to adjust length, but blends into the contours of the stock. Fits both Mil-Spec and Commercial diameter tubes, and features integrated ambidextrous QD sling connectors and thick rubber buttpad with positive no-slip texture. Buffer tube not included. SPECS: Reinforced molded polymer. 7¼" (18.4cm) long. 5" (12.7cm) high. 14 oz. (400g) wt. 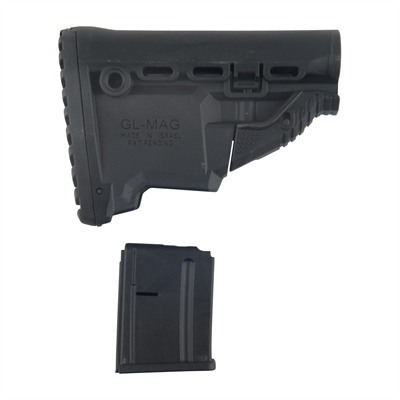 Includes one 10-rd polymer magazine.